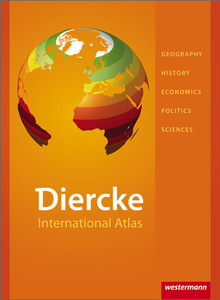 The Diercke International Atlas is the first Diercke to be rendered completely in English. 224 pages, including 195 pages of maps with more than 300 maps and over 250 graphics, an index of specialist vocabulary, a guide to pronunciation, and a 20-page introduction to maps. The contents of the maps are designed to be interdisciplinary and enable the atlas to be used in English lessons as well as in bilingual subject-specific lessons. An integrated map course develops map skills. The numerous case studies are suitable for a range of ability levels. This is the first English atlas to show physical and economic maps covering the whole world. The map code printed on each page of the map provides quick online access to background information, available at www.diercke.com (online from February 2010). Like all new Diercke Atlases, the English edition has its own globe, showing all atlas maps in 3D.